It seems all the marketing world is abuzz over social media. Everyone wants to do it, but there is no best practices approach to follow. That is until now. 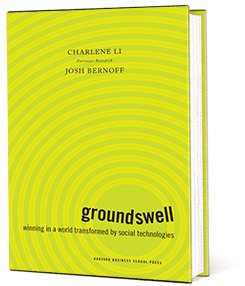 Charlene Li and Josh Bernoff, two high powererd analysts at Forrester Research published a book this spring containing their recipe for starting and nurturing social community. It’s part blueprint, part self-help book and part research report. I found it to be comprehensive and exhaustive, at least as much as any study can be at this early stage of a new wave. The book can help brands of all sizes and from all verticals, but is tilted towards the bigger firms. In typical Forrester style they have done their homework. Consumers, brands, software firms, you name it and they looked at it. The style is straightforward and easy to read, oftentimes playing back actual conversations they’ve had with clients. Case studies of course, and even some that didn’t work out. My company is just beginning to explore this new way to market our brand and content and I found this book incredibly helpful. I’ve given 5 copies out to senior executives at work, and making it highly recommended reading for my staff. It starts with listening to your customers and ends with embracing them to help you make better products. But there is a whole lot of things to do, and not do, in between. It’s all mapped out. The authors are realistic and clearly outline potential pitfalls, constantly reminding us to be patient, go slowly and get buy in at the highest levels. Near the end they challenge the more sophisticated thinkers to imagine how working in the groundswell will actually transform their companies over time. How they market, conduct service, carry out PR and launch new products. I’ve been on a hunt for more sources of value for my company, and I believe this could be a viable one. Highly recommended for anyone who wants to come up the curve quickly on social media and community. A must read for all marketers, even if you’re not looking to launch into community at this time. To get a taste of the book and the Forrester style of analyses, visit the Groundswell blog here. Or you could just buy the book here. P.S. Charlene Li has recently left Forrester. I have relied on her advice and work for several years and I will miss that. On her “Why I’m leaving Forrester” blog I wrote a three word description of Charlene Li; a rare person. Hopefully our paths will cross again some day as we navigate through our professional lives. Best of luck to her! i just started digging through this read. exhaustive is definitely accurate. i see it as a good info guide for anyone from beginner to thought leader. although the ladder may struggle a bit through parts. but so far i have gotten value out of it. thanks for the review.